Welcome to Cooinda Benalla Aged Care. We listen to your choices so we can plan care that’s right for you. You can enjoy Independent living at it’s best, when you make Cooinda’s Independent Living Units home. Feel secure and part of a community in modern, light and airy living. Choose from 1 or 2 bedroom units, or 2 bedroom with a study, all include a garage. Cooinda’s in-home services can help you live independently longer. Our in-home care can manage your Home Care Package . We can also help you with our Fee For Service in-home help if you don’t have a package. You can trust Cooinda’s experienced and friendly in-home team of local people to help you and respect your dignity and privacy. 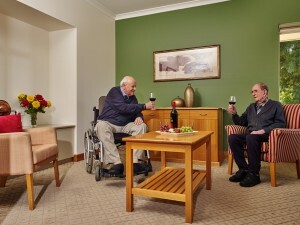 Cooinda Benalla’s 82 residential aged care beds are designed for your permanent care needs. We listen to your choices so we can plan for your physical, emotional and spiritual wellbeing. Our care staff specialise in delivering individualised, person centred, permanent care for people who are frail aged or living with dementia. Coonda’s dementia accommodation is modern, safe and secure, specifically designed to prompt sensory cues and control stimuli. Furthermore, our individual and group programs use the latest in innovative dementia care therapies so people living with dementia experience positive feelings of wellbeing and enjoyment. Our fun, Health and Wellbeing activities program will keep you active and socially connected to the Cooinda community where you do … a lot of living. Our Health and Wellbeing program has something for everyone!